Nickolas Muray was ‘a man for all seasons.’ When he emigrated from his native Hungary to the United States, at twenty-one years of age, he brought with him the belief he would make an indelible contribution. At the time of his death, he seems to have photographed everyone and everything, from presidents to pea soup. Most Americans were familiar with his photographs, if not their creator. Despite talent, personal charm, handsome looks, and boundless creative powers, he managed to live a self-effacing life. He was internationally renowned as a champion fencer; he was a pilot, and a lover of women. 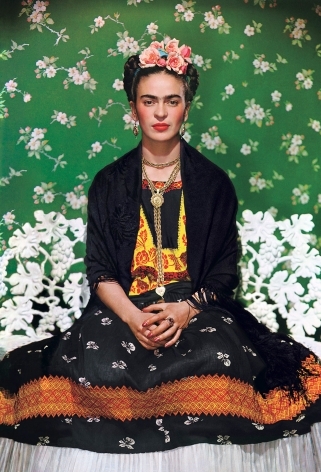 The most famous of his lovers was Mexican artist Frida Kahlo with whom he lived an affair that lasted ten years. During that time, he photographed her more than any other person outside his immediate family. Nickolas Muray was born Miklos Mandl on Febuary 15, 1892 in Szeged, Hungary. Although his name appears in the Book of Birth Registration of the Jewish Community, he was not given a Jewish name. Two years later, his father Samu, who worked as a postal employee, moved the family to Budapest in search of better educational and economic opportunities. His parents favored Miklos over the other children, as he was the most intelligent and unusually handsome, with an engaging personality. Not only did he have a temper, but he was strong-willed, rebellious, and unwilling to accept ‘no’ for an answer. Repeatedly humiliated by rampant anti-Semitism, he resented being denied, for being Jewish, opportunities given other boys. He decided as a boy that he would one day see the world, and never be confined to the limitations imposed upon him by an unfair society. In August of 1913, armed with $25, a fifty-word Esperanto dictionary, and an unrelenting determination, twenty-one-year-old Miklos Murai arrived at Ellis Island, where he became Nickolas Muray. He immediately found work in Greenpoint, Brooklyn, at Stockinger Printing Co, doing engraving and color separation. He signed up for English night classes, eager to leave behind any trace of his accent, and he proclaimed himself an atheist. In 1920, a friend suggested Nick open his own studio. Nick moved to a 2-room apartment at 129 MacDougal Street in Greenwich Village, where he lived in one room and worked in the other. Forced to economize at first, Nick kept all the lights out, except for one bulb. When a client rang the doorbell, he would turn on all the lights. Fortunately, Nick did not have to wait long for his big break. The art director for Harper’s Bazaar commissioned Nick to photograph Florence Reed, who was starring on Broadway. Overnight, his evocative, soft focus style of portrait photography became a sensation. He was soon photographing everybody that was anybody: actors, dancers, film stars, politicians, and writers. As he grew more successful, he held Wednesday night soirees in the studio for friends and acquaintances to meet, eat, and drink – many brought flasks, as it was prohibition time. It was not unusual for Martha Graham, Langston Hughes, Helen Hayes, Paul Robeson, Gertrude Vanderbilt, Eugene O’Neill, or even Jean Cocteau to make an appearance. In 1923 Nick met artist Miguel Covarrubias, whose friendship would change Nick’s life. Nick and Miguel contributed to many of the same publications, and became the best of friends. Nick visited Miguel in his native Mexico in 1931. On that trip, Nick met Frida Kahlo, who was married to Diego Rivera. Nick and Frida’s first meeting was certainly serendipitous as Frida was supposed to have been with Diego in San Francisco. Over the next ten years, Nick and Frida carried on a love affair in which they traveled to see one another in Mexico and New York. Their love affair is richly documented, both in their correspondence to one another, and by Nick’s iconic portraits of Frida. But despite their mutual passion, Nick eventually came to see that Frida would always stay true to Diego. He moved on with his life in New York, but a part of him would always be in love with Frida. Following the stock market crash, Nick shifted his major focus to advertisement photography. In 1931 Nick pioneered the first illustration from a color photograph to be published in an American mass-publication magazine, a swimming pool advertisement in Ladies’ Home Journal featuring seventeen live models wear beach wear in Miami. Even charging $1,000 for a color page, he couldn’t fill the incoming orders fast enough. Soon he also had a contract with Time to do color covers for the magazine. In this period, Nick became one of the leading practicioners of color photography. Throughout his life, Nick practiced fencing at the highest levels. Even while maintaining his place at the cutting edge of his profession, he found time to train and compete. He was the U.S. Saber Champion in 1928 and 29, and he represented the US in the 1928 and 1932 Olympics.